Dust off your boots and saddle your horse-or hit the beach. The Aficionado will stand the test of anything you can throw it's way. 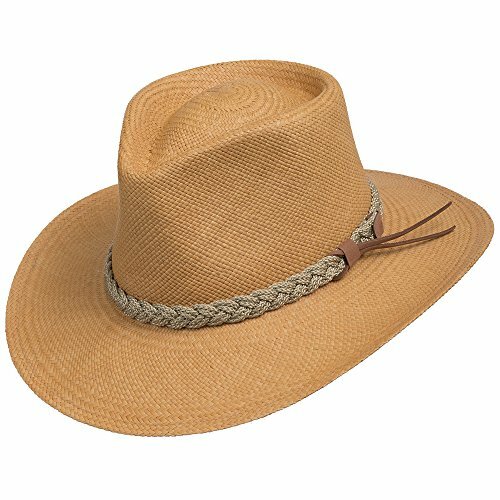 Hand-woven in Ecuador, this hat has a reinforcing cloth insert on the underside of the crown, so it's shape and style will never fall flat. The braided band detail lends that rustic charm, and eye-catching detail. Ride off into the sunset, and see what awaits. Handwoven in Ecuador, hand-finished in USA. Ultrafino is a registered trademark. Any form of abuse, trademark infringements is serious business and will result in the punishment of Amazon team and U.S. Trademark law. If you have any questions about this product by Ultrafino, contact us by completing and submitting the form below. If you are looking for a specif part number, please include it with your message.